Protect yourself! The sun is strong and it doesn’t take long to burn, so be sure to take your sun protection. This might be a combination of sunscreen; sunglasses (100% UVA and B); wide-brimmed hat; lightweight, long sleeved shirt, skirt, shawl (cover up). * A note of interest: There is some evidence that sunscreen may be detrimental to wildlife, so try to use environmentally safe types and combine your methods of sun protection. “Water, water everywhere, but not a drop….” Whether you’re beaching or hiking, you’ll need to be sure you stay hydrated. Some beach locations will have concessions but the more remote areas will not, so bring liquid. You can find stainless steel reusable water bottles that can be filled from the faucet or from a gallon jug, but if you use individual plastic water bottles, be sure to dispose of them responsibly. Snacks are another good thing to have on hand. Popular items might include granola bars, crackers, dried fruit and nut mix. Best to leave the chocolate, and other potentially gooey goodies, for when you get home. Nonetheless, you might want hand sanitizer and moist wipes. If convenient, you might want to pack a cooler. Remember to keep in mind any medications needed, and consider an allergy remedy in case that might be a concern. A small first-aid kit is handy, too. When heading to the beach, be sure to bring your bathing suit. Imagine remembering everything EXCEPT that! But you’ll also want to plan for a “cover up.” Lightweight gauze or cotton is great to keep cool and provide some sun protection. If you plan to go inside a restaurant or bar, you’ll need to be covered, so think about a change of clothes. 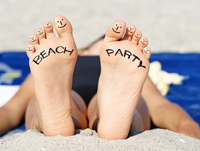 Sandals or flip-flops are great for the beach and can be worn in most establishments. You might consider water shoes as well, especially if the shoreline is rocky. Searching for Real Estate in Naples FL and need a professional Real Estate Agent to find the property of your dreams? Get started by browsing through our complete list of Naples Real Estate Agents.